In 1997 I, by chance, came upon a PlayStation Version of Tomb Raider II. I was fascinated by the game and not two weeks later I also owned the original Tomb Raider. In 1999 I created my first personal website and Tomb Raider had its place on it. Two years later it had reached a point where Tomb Raider took up too much of the website's space. That's when I decided to get a real domain for it. A name had to be picked and I decided on tombraidergirl as it expressed something that was very important for me, that tomb raider was a game with a strong female character in the lead role and also that it attracted a lot of female gamers. So tombraidergirl.com was born and went online on July 10th 2001. As I am from Germany it would have been logical to make it a German website, but I got Tomb Raider I and II when I was staying in England and so I decided to make an English version, too. The tombraidergirl Forums (first using the name "Lara's Treasure Room") was opened on February 18th 2002 as a gameplay-help platform. That was when I first started using tombraidergirl as a username (a decision I am not always happy with, as it may seem as if I have given the website my nickname, instead of the other way around). The forums quickly grew to be something more than help forums with lookalikes and fanfiction writers paying a visit. In 2006 I got the domain laracroftforum.com. 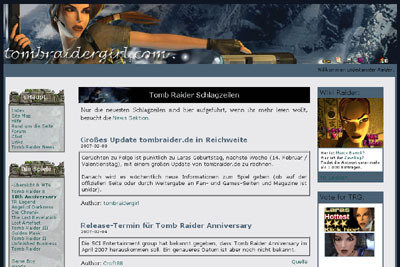 Since July 1st 2002 the English and German parts are split into tombraidergirl.com and tombraidergirl.de. On December 10th 2002 larasmansion.com was founded and at that time hosted the image galleries. Two years after the foundation of the forums, on December 2003 it moved to a new server and got its own sub-domain: http://forum.tombraidergirl.net/. 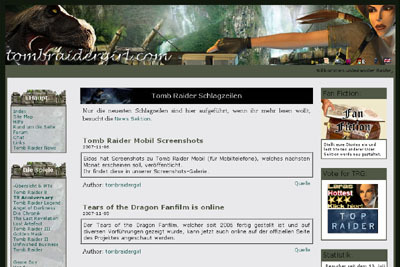 The domain tombraidergirl.net was not used back then and only served as an overview page. In the early 2000s its been in use as portal for the media archive. On October 30th 2004 the project WikiRaider, a Tomb Raider encyclopaedia, was founded. In 2014 I registered tombraider.cologne, which I have not found a real use for yet. Although I have this funny idea to provide a webpage in "Kölsch", the dialect spoken around the Cologne area. In late 2015 the site was comepletely overhauled and stuffed into a database structure.